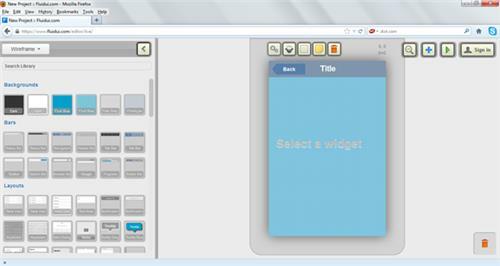 Are These 5 Mobile Apps in Your Web Development ToolKit? Web development today is more complex than ever with so many resources and options available on the market. The landscape is confusing and must be carefully navigated in order to apply the right solution to your business needs. Whether your objective is to build a mobile website, a hybrid or native application, or a standard desktop application, you have to know which resources to best apply to completing your job. There are two sides of the coin when it comes to developing web applications: software and hardware. The hardware supporting web development has remained fairly stable (think traditional keyboard and monitor) while the software continues changing at a dramatic pace through HTML5 and open web technologies, drag-and-drop platforms, and customizable templates. At the end of the day, developers must choose smart tools to get the job done in whatever environment they work best, whether PC, iPad, or iPhone. The following article will survey 5 must have mobile apps or mobile friendly websites that describe the basic development cycle for designing and implementing a new mobile website or desktop application. A nice feature about Fluid UI is that it’s painless to test. Simply click on FREE TEST and you’re immediately brought to a nice Sandbox editor with an array of tools available to help you start prototyping a mobile app. Developing Apps on Your iPad? The lines between PC and mobile continue to blur to the point that app development is going increasingly ‘mobile.’ Codea is one such answer for the developer on the run who not only wishes to “write once, deploy everywhere” but who just wants to code anywhere as well! 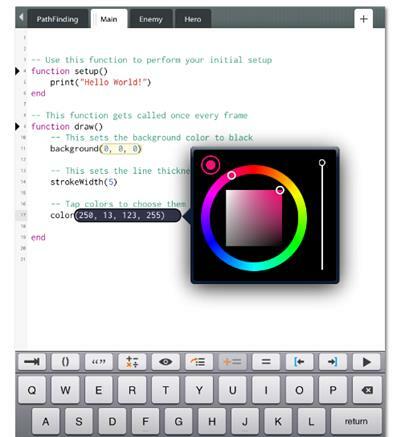 Codea is an iPad App that allows game designers, educators, and students to create games and other visual interactions directly on their iPad. The application is based upon the Lua programming language, which provides a rich tapestry of tools and visual interactions; so that users can touch colors and images directly in the code to visually edit them. For instance, if you type in the command “color ()” a color palette will immediately open with different options that can be adjusted by interactive touch. And at any time the code can be tested or played through an interactive viewer that responds to multi-touch, accelerometer, and more. Codea is one of the most elegant code editors available, and the ‘tap and drag’ and visual editing features offer a sneak preview of where the next generation of coding is heading. Efficient application development requires the ability to efficiently upload, share, and track the latest revisions of your code, especially in an increasingly mobile-centric world where coding on the fly is becoming the new reality. GitHub, the world’s most popular open source code repository site, offers a web-based hosting service for software development projects that uses the Git revision control system. The site offers both paid plans for private repositories and free accounts for open source projects. 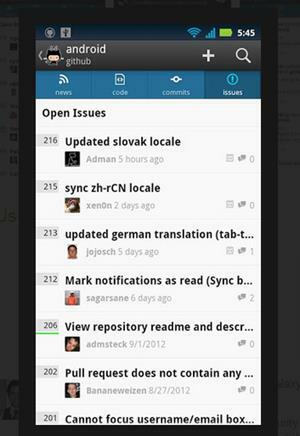 The mobile version of GitHub, github:mobile, is an idea tool for developers to track code on the fly in the mobile age. Either Android or Apple Store versions of the App are available and allow users to create, manage, and discuss code issues while keeping updated through an integrated news feed for all your organizations, friends, and repositories. The GitHub Android app is open source and can be downloaded at https://github.com/github/android. 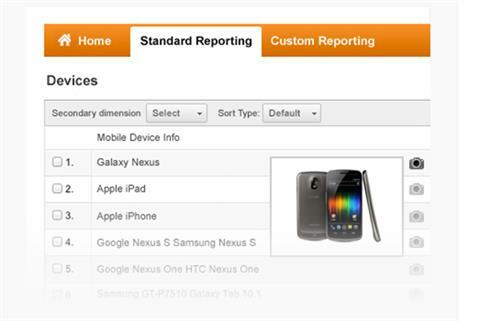 Viewport resizer is a browser-based tool that developers can use to test a website’s responsiveness and sizing adjustments on different devices. To start using this tool, simply save the bookmarklet to your browser by dragging it into the bookmarks, open up the page you want to test, and click on your created bookmarklet. The parallels between the current explosion in mobile development and the PC/Internet phenomenon of a decade ago are striking in many ways. Just as every website then required web analytics to cover site traffic and monitor SEO, so today an appropriate mobile first strategy requires the need to monitor mobile apps and understand how they drive business to you. Google Analytics Mobile app analytics platform delivers the same quality that users have come to expect for monitoring their websites, and applies that robustness to the world of mobile web apps. Gartner research estimates that mobile will eclipse PCs for total Internet traffic usage this year. And so the need to understand and analyze mobile traffic to your website can help you decide whether to implement responsive design, or whether the traffic justifies a separate mobile site. To conclude, application building continues to change ever so dramatically as today’s savvy developer is faced with more and more options for how and where to code. Whether on a PC, iPad, or iPhone, he or she must choose smart tools to align the application outcomes with business objectives. In the preceding, we’ve discussed a selection of 5 tools that are ‘must-haves’ for helping the developer to efficiently plan, develop, track, test, and analyze their applications in the Mobile Age.